The Guatemala guidebook is out! Yes, as of September 2015 the book is on sale at Amazon.com and other online distributors (in Europe try canotier.com). The price is $35 (USA shipping included). It details all the known runs in Guatemala, and has lots of good background stories to boot, so get yours today! If you are interested in obtaining multiple copies, you can get a better price ($27.50 per book or less) by emailing me directly. The Chiapas & Belize guidebook is available too! The 2nd edition Chiapas & Belize book is also available on Amazon.com and other online distributors (in Europe try canotier.com). If you would like one of each book, I can offer you both for $55 including US postage, just email me. If you are interested in an electronic version, contact me. Note that the books are written in English. If someone out there wants to take on the project to translate one or both to Español, let me know. In case you are interested in what others have written about the area's whitewater, check out this list. About the author. American-born Greg Schwendinger has been paddling Central America and the world since 1999 and has lived in Guatemala since 2002. In his previous life he was an electrical engineer for Intel Corporation in California. His passion is exploring new rivers and letting others know about them. He has survived more than 250 first descents in Central America. 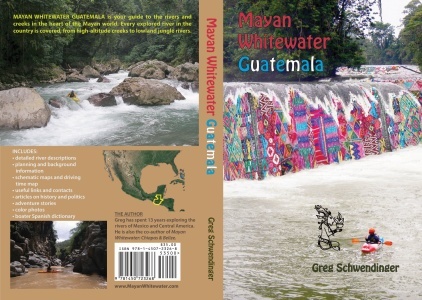 He has given slideshow presentations to paddlers groups and the Guatemalan Institute of Tourism, and written for Paddler magazine. He was featured in the documentary Rios Guatemala: The Preservation of Wild Rivers.